A police officer is to be protected by a restraining order after her personal mobile phone number went public and she was bombarded with calls. Two women started making the calls to the PC at all hours giving false names and using a pretend Indian accent. One of the women accused of making the calls admitted harassment when she appeared before magistrates. Rebecca Harnett, 21, of Dinmore Avenue, Grange Park, was made the subject of a restraining order which forbids her contacting the officer by any means until further notice. She was given a nine week jail term suspended for a year and must keep a nine week 6pm to 6am curfew. She must pay £160 costs and £50 compensation to her victim. The court heard that the female officer gave her personal mobile number to a hotel where she was making arrangements for her police team’s Christmas party. A member of staff at the hotel then passed on that number and the calls started . Gary McAnulty, defending, said: “This woman has a low self esteem and clearly is influenced by alcohol. A former drugs counsellor who fell off the wagon and returned to a life of crime when he started taking drugs again has been jailed. John Boden had been clean of drugs for two years and became a model citizen helped others. But he returned to drugs and after taking 10 diazepam tablets one day, he went to a hotel where a cheerleading competition was being held and stole property worth more than £1,000. Boden, 45, of Snowden Close, Blackpool, pleaded guilty to seven offences of theft. He was sentenced to 196 days imprisonment and ordered to pay £115 victims’ surcharge by magistrates. On January 22 Boden went to the resort’s Norbreck Castle Hotel where a Cheerleading competition attended by more than 1,000 people was taking place. He stole computers, cash, a speaker and an iPhone valued together at £1,110 belonging to people at the hotel. An organiser of the cheerleading competition used his own phone to track the stolen iPhone and follow Boden. He was found at a cash point behind the hotel and put under citizen’s arrest until police arrived. A man attacked his friend leaving him with facial injuries consistent with being in a car crash has made his first appearance at court. Adam Johnston is alleged to have punched a man to the floor and then repeatedly kicked him in the face and head. Johnston, 26, of Central Drive, Blackpool, is charged with assault causing actual bodily harm. Prosecutor Sarah Perkins, asked for the case to be heard at crown court. Defence lawyer, Mitch Sarangi, said his client would not indicate a plea to the offence at that stage. Johnston was bailed to appear at Preston Crown Court on February 22 by magistrates. A single father-of-two was found with a wrap of cocaine after police stopped his car in Blackpool. Dean Grogan, 38, of Apple Tree Close, St Michaels, pleaded guilty to possessing a class A drug. He was fined £120 with £85 costs and told to pay £30 victims’ surcharge by magistrates who ordered the destruction of the drugs. Prosecutor, Sarah Perkins, said police stopped Grogan on January 10 at 3.30pm as he drove a Fiat Punto on Victory Road. A wrap of crack cocaine was on the driver’s seat. Grogan admitted he had bought the rock of cocaine for £20 and said he had been going to smoke it with his woman passenger. Grogan had previous convictions for producing and possessing cannabis. Suzanne Mugford, defending, said her client had not been in trouble for three years. He had complied fully with the police and pleaded guilty at the earliest opportunity. A family-of-five were injured on their way to a funeral by a hit and run driver at Singleton. Christopher Dixon crashed into the rear of the family’s car before fleeing from the accident scene. The father, his adult son and three woman received lacerations, bruising and whiplash in the crash which took place only hours after Dixon had appeared in court for an offence of assault. Dixon, 24, of Pheasant Wood Drive, Thornton, pleaded guilty to careless driving, failing to stop after an accident and failing to report it and breaching a suspended prison sentence order imposed for assault. 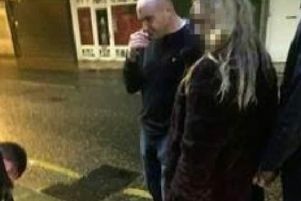 He was sentenced to four weeks imprisonment suspended for 21 months, put on a 16 weeks curfew from 8pm to 6pm, banned from the road for one year and ordered to pay £85 costs with £115 victims. Prosecutor, Sarah Perkins, said a family travelling from Edinburgh for a family funeral in Blackpool stopped on Garstang Road, Singleton, on November 8 at 11.50pm, to turn into a service station. The father of the family described Dixon’s Mercedes hitting the rear of his car at speed, spinning the father’s car 360 degrees. The father and his son went over to Dixon and said he smelt strongly of drink. They told him the police had been called and he must stay at the scene, but he drove off. Brett Chappell, defending, said towards the end of the year Dixon and his long term partner had split up. He lost his home and contact with his child was through social services. He had been diagnosed with depression and psychosis for which he was receiving strong medication. In addition his father was dying from cancer. The morning of the accident Dixon had appeared in court. He was given a suspended prison sentence for assault and told if he got into trouble again he could end up in custody. Six hours later he caused the crash in a momentary lapse of judgement and in panic he fled fearing he would be sent to prison and not be able to be with his father in the last week of his life.